76071 OBL GERMANY (1930) Hand holding telephone*. 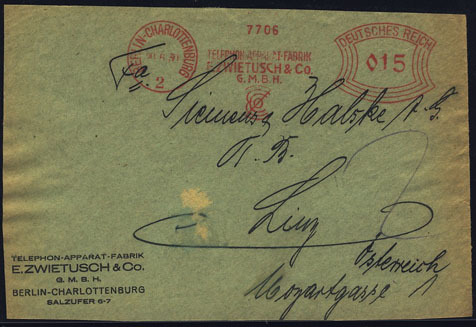 Line cancelation on envelope (note perfined stamp): "Fernsprecher Spart Tund Geld." 55613 EMA GERMANY (1930) Telephone apparatus. 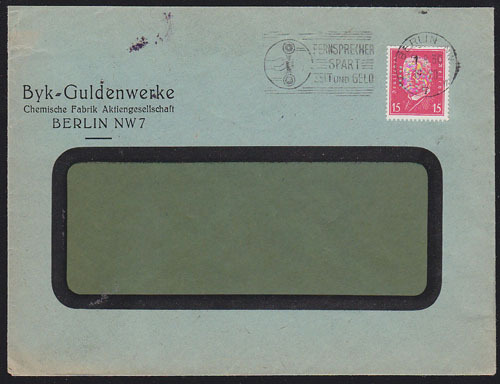 Red meter cancellation No 7706 on envelope front "Telephon Apparat Fabrik E. Zweitusch & Co. GMBH." 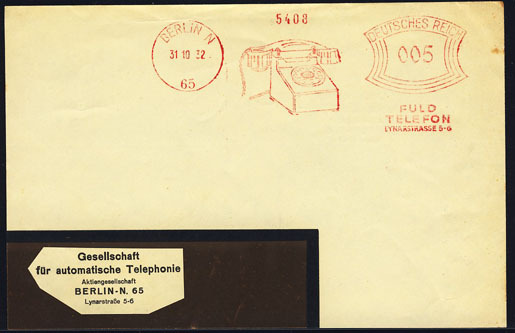 55614 EMA GERMANY (1931) Telephones. 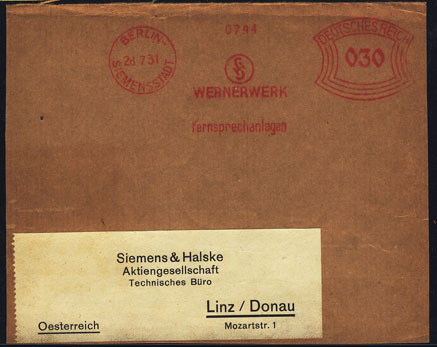 Red meter cancellation No 0794 on envelope front "Wernerwerk fernspechenlagen." 55615 EMA GERMANY (1931) Telephone book. 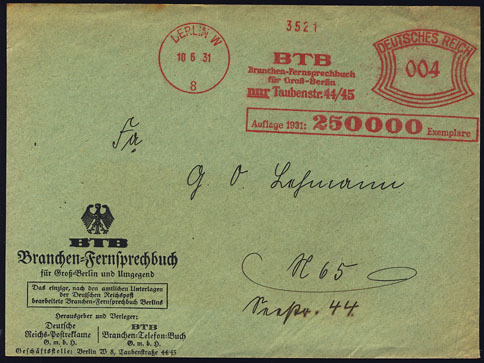 Red meter cancellation No 3521 on envelope front "BTB Branchen-Fernsprechenbuch fur Gross-Berlin." 55610 EMA GERMANY (1931) Telephone. 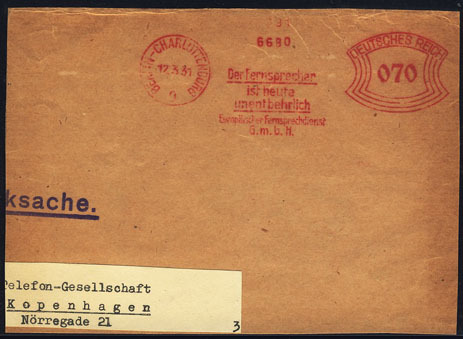 Red meter cancellation No 6680 on envelope: "Der Fernsprecher ist heute unentberlich." 55605 EMA GERMANY (1932) Telephone*. 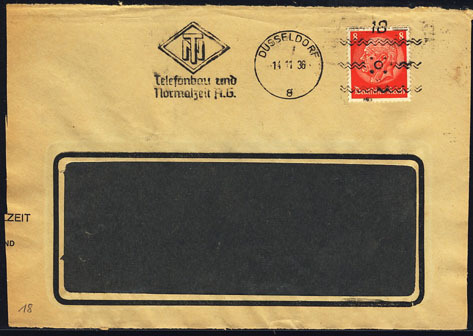 Red meter cancellation on envelope "Fuld Telefon". 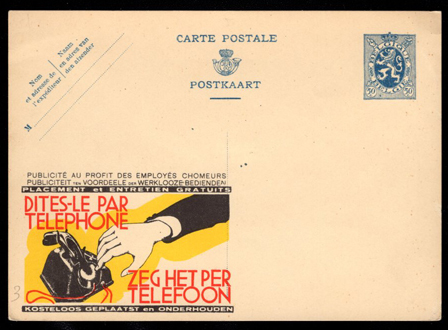 55617 ENT BELGIUM (1934) Hand* reaching for telephone*. 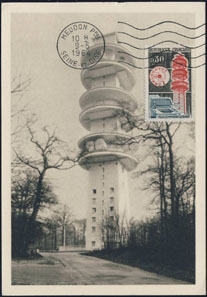 Postal card (O) with illustrated ad "Dites-Le Par Telephone." 55611 OBL GERMANY (1936) Company logo*. Nice cancelation of Telefonbau und Normalzeit A.G.
55616 EMA INDIA (1936) Antique telephone*. 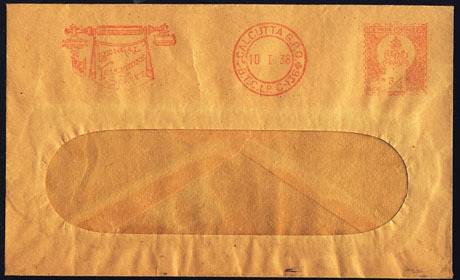 Very faint red meter cancellation on envelope "Bengal Telephone". 49626 EMA U.S.A. (1946) Telephone making humming noise*. Violet meter cancellation on envelope Pitney Bowes No 57704: Please wait for Dial Tone Before Dialing. 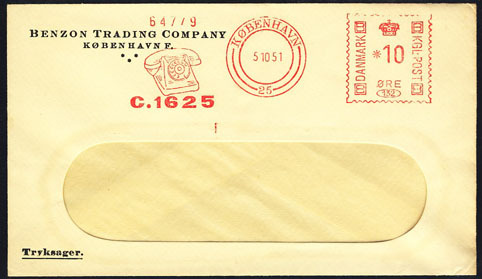 55608 EMA DENMARK (1951) Telephone*. Red meter cancellation No 132 on envelope. 28934 EMA U.S.A. (1954) Telephone*. Red meter cancellation on envelope Pitney Bowes No 226054:Call Kennedy Today! 55609 EMA FINLAND (1955) Telephone*. 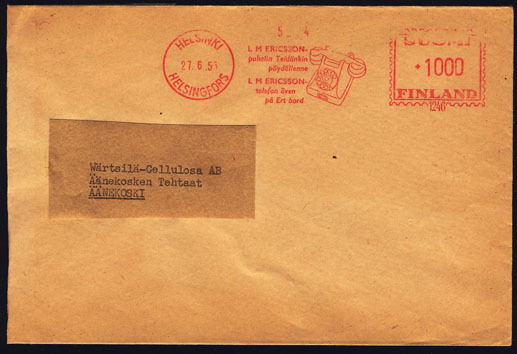 Red meter cancellation No 1246 on envelope: "E. M. Ericsson. puhelin Teidankin poldallene". 55604 ENT U.S.A. (1955) Hand* holding ringing telephone*. 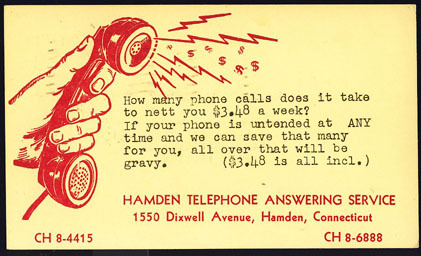 Postal card (O) with illustrated ad for telephone answering service. 55612 EMA AUSTRIA (1960) Telephone book. 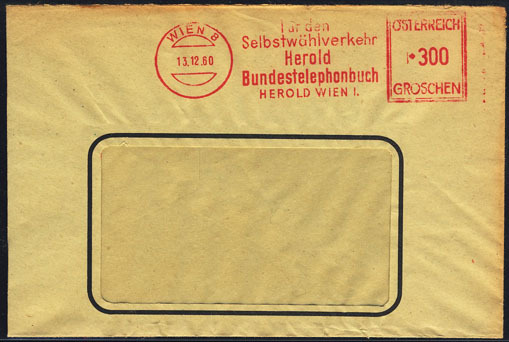 Red meter cancellation on envelope: "Fur den Selbstwahlverkehr Herold Bundestelephonbuch Herold Wien I." 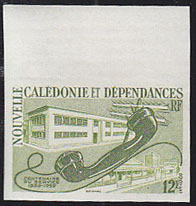 31968 ESS NEW CALEDONIA (1960) Telephone receiver*. Trial color proof. Scott No 314, Yvert No 298. 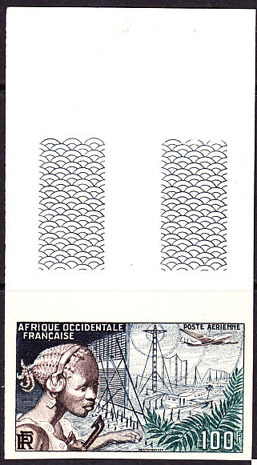 57791 MAX FRANCE (1964) Telecommunications tower*. Maximum card. Scott No 1088, Yvert No 1417.